The Yuin people are the traditional owners of Wallaga Lake land. For thousands of years, they roamed the lower ranges and coastal flats, living off the rich abundance of food around the lakes, waterways and ocean. The strong connection between the people and their land, which held their sacred sites, was tied to their belief that supernatural beings created their world and established the foundations of human life in the time known as the Dreaming. 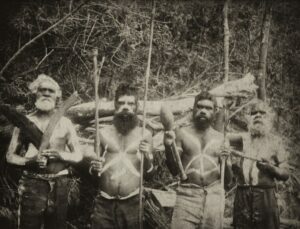 By respecting the order of things brought into creation by their ancestral beings and acting in accordance with the prescribed rules of behaviour, the Aborigines believed they would perpetuate a stable food-producing environment and harmonious social order from generation to generation. Long ago Daramulun lived on the earth with his mother Ngalalbal. Originally the earth was bare and ‘like the sky, as hard as stone’, and the land extended far out where the sea is now. There were no men or women, but only animals, birds, and reptiles. He placed trees on the earth. After Kaboka, the thrush, had caused a great flood on the earth, which covered all the coast country, there were no people left, excepting some who crawled out of the water on to Mount Dromedary [Gulaga]. Yuin is the generic name for the different groups who occupied territory from Cape Howe to the Shoalhaven River and inland to the Great Dividing Range. A number of groups form the Yuin Nation, including the Wandiwandian, Dhurga, Bidewal, Walbanja and the Djiringanj. The ‘Walbanja’ occupied the area between Durras and Narooma, and the Djiringanj (pronounced dearin–jarn) from Narooma, south to Bega and west to the top of the range. To the Yuin people, Gulaga is the Mother Mountain where the creation story begins and creates the connectedness between all these groups. One day her young son Barunguba came to her and asked if he could leave home, Gulaga let him, so he moved far out to sea (Montague Island). On seeing that his big brother had left, Gulaga’s youngest son, Najenuga, wanted to leave too. Because he was so young she permitted him to move only a short distance away where she could keep an eye on him (Little Dromedary). 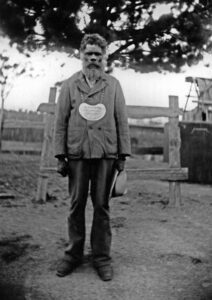 King Merriman of the Umbarra or Black Duck totem, was the revered leader of the Djiringanj for many years from the late 1800s. He was an important contact for anthropologist A W Howitt, and was the most noted song-maker, cultural authority and spiritual leader on the far south coast. Merriman married Princess Narelle from the Moruya district. 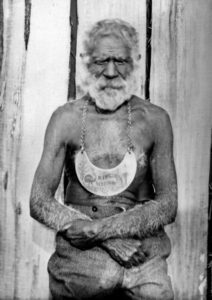 ‘Biamanga’, Jack Mumbulla, followed him as headman of the Wallaga Lake clan. The totemic system links Koori people to the natural world in their social relationships, their ecological knowledge, and their beliefs and rituals. While individuals will have personal totems, Umbarra is the totem of the Djirinaganj tribe. Mumbulla Mountain is also spiritually significant to the Yuin people.